I have always loved Valentine’s Day because it celebrates love! My husband’s unromantic side, however, thinks it is more of a “marketing holiday”. Not here! This year, I decided to host an early Galentine’s Dinner Party for a group of some of my favorite gals here in Denver. We all recently traveled to Scottsdale for a girl’s (aka “Peaches”) birthday trip and had a blast!! I thought it would be nice to get us all back together to reminisce, look back through all of our photos and giggle again over all of the hilarious and meaningful moments we shared. “Peaches” and her fabulous personality is what inspired this Galentine’s dinner party in honor of Valentine’s Day and her big birthday! The famous writer, Jodi Picoult, said: “You don’t love someone because they’re perfect, you love them in spite of the fact that they’re not”. I am so blessed to have such great friends that love each other…flaws and all. Our imperfections are part of what makes us so special to each other…precisely what we will be celebrating! 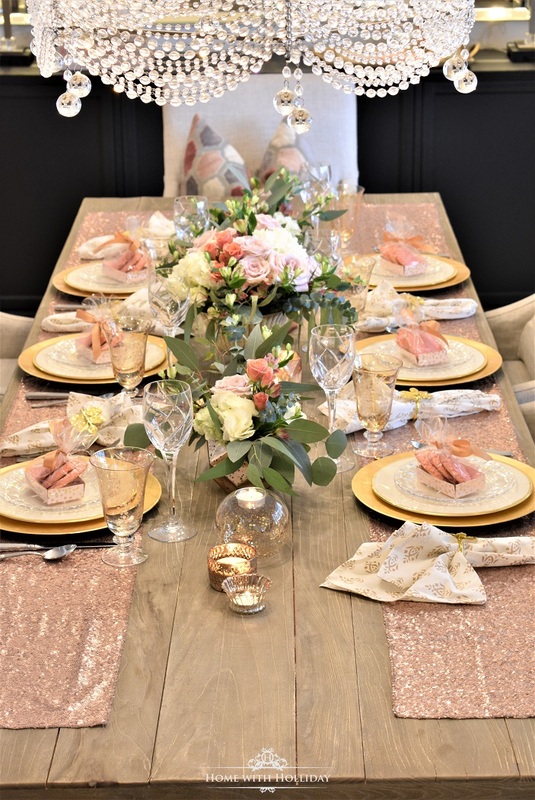 To put this Galentine’s party table setting together, I started with the rose gold table runners. To save money on placemats, I decided to use them under the plates instead of a traditional setting where the runner is used down the middle of the table. It totally adds to the glamour of each place setting with that backdrop. These runners (shown below) were only $9.99 each, so it was super inexpensive to create this look. When entertaining guests, I think the most important goal is to make sure your guests feel special. That’s exactly why I designed this table setting to be a bit fancier. Plus, I love any opportunity to bring out my Waterford and LENOX! However, there are so many other products out there that look almost identical to these, without the hefty price tag. I included both options below, including some awesome alternatives from The Dollar Tree. While shopping for this party, I fell in love with these adorable, whimsical napkins and napkin rings from Wisteria! The gold printed design actually has a metallic finish so they tied in really well! For an event like this, I think fresh flowers are a must! That doesn’t mean you have to spend a lot of money. I purchased all of these flowers mostly from Trader Joe’s, but also from my local grocery store. The formula to create these arrangements is pretty simple. First, I recommend choosing three different sizes of flowers. After you install the wet floral foam and fill your container (click here to view the vase I used) with water, add the largest flowers you are using placing them low in the arrangements. Next, add in your medium sized flowers (in this case, that was the roses…a variety of them). Finally, layer in the smallest flowers and finish up with adding in the filler/other greenery to add balance and more texture. What makes them simple to do is the fact that they can be “messy” and still look great! They do not have to be “perfect”. The smaller arrangements are just “mini” versions of the larger one. For your own Galentine’s Party, you could use any variety of color palates. Reds, reds and pinks, all pinks, pinks, and peaches or all white would even be stunning for a table setting like this! To create a wonderful event for your guests, it’s all in the details. Once I wrapped up with the place settings, I simply placed a variety of color-coordinated votive holders around the arrangements. Candlelight for an event like this is must!! Speaking of the details, I couldn’t resist capturing a shot of my tiny, antique salt and pepper vessels! They belonged to my grandmother and are so special to me. This was the perfect occasion to bring them out and feature them. They were a huge hit with the gals! For occasions such as this, I typically create party favors for my guests. For this table setting, they became part of the design. Try to coordinate the favors with the color theme of the table setting. These pink sugar cookies tied in perfectly! The adorable packaging came from Hobby Lobby and, BONUS, they had coordinating napkins! Win, win! When setting up for a party, be sure to consider the whole room and how you might be able to spread your theme around the room. For this event, I changed out the decor on my buffet to coordinate with my color palate. My “fixer upper” home was built in 1972, so it features two bay windows in my front rooms. I love to accessorize them through the season changes or for a party. I love the idea of my guests being able to sit in them and chat with other guests!! Super cozy!! It was such a lovely evening and I had such a great time putting this all together. My “girl’s” deserve the very best!! I just love this shot of the room reflected in my mirrors!! I recently shared a post on Styling with Mirrors that you can check out here! Thank you so much for stopping by today! Valentine's Day is a perfect opportunity to show your love and appreciation to those whom you love, including your close friends. Hosting a Galentine's Party...too much fun!! If you are still looking for Valentine's Day gift ideas, check out my Gift Guide of All Things PINK! Now that we are in a new year, I will also be sharing more interior design and home decor ideas and inspirations. Please consider subscribing to my blog so you can receive instant notification of my new posts! Thank you so much! It was super fun to put together. I really appreciate your kind words!! my first to hear of a gal entine party. Beautifully done! Thank you!! It was a fantastic evening! I’am enjoying your blog-site and look forward to more posts in the future. I searched and could not find the cookie boxes used for the guest favors. That is something I would do, and the box makes the cookies quite special. I look forward to more ideas in the future. Oh, my goodness! That is so sweet of you to say!! What made my table more beautiful is you sitting at it!! Thank you for hosting such a fun party! You thought of every detail down to the cute salt and pepper dishes from your grandmother! Hugs Holliday we love you! Thank you so much Jeanne and thanks for stopping by! Thank you so much and thanks for stopping by! Happy Valentine’s Day!! wow this is so gorgeous!!! Thank you so much, Rhonda! I appreciate your kind words! It was fun to put together! Oh so gorgeous and I’m so happy that you linked up to my party at the style showcase! Will be featuring your blog on Weds! Beautiful and well thought out event! You are my inspiriation! Oh, my goodness Kenesia! You just made my day!! Thank you so much for your kind words. Have a wonderful day!